Whether you prefer to purchase raspberries by the pint from the grocery store or at a farmers’ market, pop a few juicy berries in your mouth and enjoy a sweet-sour sensation of summer. In warm weather, find a farm to pick your own and spend a day in the sun plucking (and eating) fresh, juicy raspberries off the bush. Just don’t forget to save some to make your favorite sweet and savory raspberry treats. From pies and tarts to savory salads and entrees, the possibilities are enticing. Start your culinary adventure with these delicious, healthy recipes. Raspberries are a great source of fiber—some of it soluble in the form of pectin, which helps lower cholesterol—and an excellent source of vitamin C. The gorgeous red color is from anthocyanins, an antioxidant. 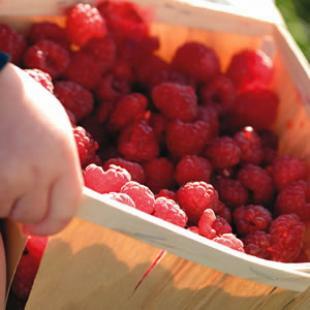 Choose juicy-looking, brightly colored fruit, as raspberries do not continue to ripen once picked. If the hulls are still attached, don’t buy the berries—they were picked too early and will be sour. 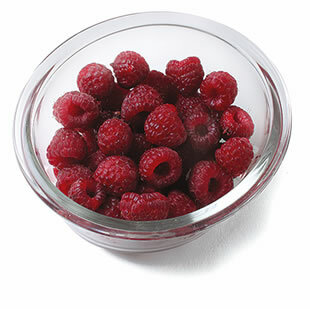 As with all berries, check raspberries for signs of mold or spoilage. Fresh raspberries are fragile and highly perishable. Store them in the refrigerator and use within 2 days. To wash raspberries, gently spray with a fine mist just before using—the weight of water pouring from a faucet may crush them. Brining enhances flavor and renders pork chops moist and juicy. While the chops brine, prepare the pickled onions and the raspberry sauce. The thick flavorful sauce, rich pork chops and pickled onions all come together in an explosion of flavors and textures. The secret to the sparkling flavor of these delicately crumbed muffins is the strips of lemon zest finely ground into the sugar. Enjoy the muffins warm right from the oven. You can quickly make the crust for this tart in the food processor and then press it into the pan—no need to dig out a rolling pin and struggle to transfer a tender pastry dough from pin to pan. Extra crust dough doubles as a crumbly topping. Tart raspberry filling is swirled into a low-fat cream filling in these beautiful bars. They're a festive treat for a summer picnic or party. Jammy raspberries and rich chocolate combine for a delicious, tart frozen yogurt. It is quick and easy to prepare, but plan ahead if you're using fresh berries—they take a little longer to freeze. Mini chocolate chips give you the most chocolate in every bite, but any kind of chip will work—dark-chocolate lovers should try bittersweet chips. A fruit crumble offers the luscious flavor of a fresh fruit pie without the fuss of making a crust. Celebrate the arrival of late-summer peaches with this rich-tasting crumble. The nut-studded topping works great with other fruit combinations too.